A technical post is now available on The Body Blogger platform: Night of Biocybernetic Zombies. Body blogging is the act of logging how your body changes over time using web technology (e.g. a blog). This log can be used to inform ourselves how our activities and environment affects us in our day to day lives (e.g. logging weight on an exercise website). This data can subsequently be used to modify our own behaviours if we so wished (e.g. weight data could be used to determine which exercises are most effective for sustained weight loss). Wearable sensors allow us to record personal data about ourselves continuously without our intervention, and with wearable sensors becoming more pervasive the rise in body blogs is expected to continue (e.g. at June’s E3 2010, EA demonstrated their latest EA Sports Active which logs how much the player exerts themself during a training exercise using their heartbeat rate, this data is subsequently posted to a social media site being developed for the product). This presents an interesting avenue of research to explore which we’ve talked about previously at Physiological Computing. If our physiological (internal) state is laid out before us what can we learn from it when we observe it over a period of time? What behaviours will we change as we become more aware of how different activities and changes in our environment affect us? And what is the impact of making this information public both for the participant and those who view it? Recently at Physiological Computing we’ve been experimenting with body blogging using a wireless heartbeat monitor. Our body blog monitors a user’s heart activity 24 hrs a day providing them real-time feedback of their physiological state as well as long term trends which are also posted online for public consumption. Using our body blog the current user has learnt how different forms of physical exercise affects their heart, their circadian rhythm, that exams are more stressful than walking or breaking into a slow jog as well as minor fun things such as how a high calorie sandwich makes the heart beat much faster or that sitting down after a brief stroll causes a large drop in heartbeat rate. While the things we might learn about ourselves may appear trival this information can have a significant impact on the user’s behaviour when they have access to it. By experimenting with body blogging ourselves we can learn what responsibilities body blogging applications should undertake to protect their users as well as the utility of using certain physiological measures over others. For example after learning the effect of the high calorie food our current user reduced consumption of this particular product. But while we may see this particular behaviour modification in a positive light, body blogs can also act act against the user. For example before the user associated sitting down after a brief stroll with a large drop in heartbeat rate, the first time they encountered this was not a pleasant experience for them. After coming into the office one day and sitting down the user became aware of their heart activity as the blood was pumping rather loudly. Out of curiosity the user checked the real-time feed and saw their heartbeat rate was far below (-10 beats per minute) their usual baseline of 60 bpm. Their heart was in fact registering their body as if it was in its sleep state (you can see this online by looking at the night tweets). Furthermore their heartbeat rate was still dropping at which point the user started to worry something was wrong. As their heart continued to slow this developed into panic and while their heartbeat rate eventually stabilised and returned to normal this experience which would of normally been ignored was only exacerbated by the user having access to their internal state. As you can see access to our internal state can be both a boon as well as a curse. Through our experiments we seek to figure out what we can learn about ourselves through our physiology as well as the dangers in its use, as well as how it impacts our behaviour when its made public both from the participant’s perspective and their followers. All of which we’ll discuss in the future here at Physiological Computing. To view the public version of our body blog visit our twitter page at http://twitter.com/bodyblogger. The feed provides 30 minute snapshots of our user’s heart activity. Each tweet is time stamped to provide a continuous data stream allowing viewers to see long term patterns such as the sleep cycle and circadian rhythm (day cycle) as well as short term events such as exercise recovery. For twitter users the feed is best viewed as a list, instructions on how to create a list can be found here. Up to the minute physiological data recorded and visualised by Pachube. Visit the Body Blogger Pachube feed here. This feed updates only during office hours (9am – 5pm GMT). This website’s graphical user interface has been turned into an online mood ring. Using the online heartbeat rate of our body blogger the colour scheme of the site is set according to the users current physiological state. These ranges and their implied state have been configured for our current body blogger who transitions through them on a daily basis (e.g. burning – running). For more information about body blogging you can read Physiology as XP – Bodyblogging to Victory, a position paper we presented at the BioS-Play 2010 workshop in September in which we extended the body blogging concept to computer games (see the BioS-Play experience report). 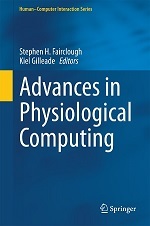 You can also check up on the latest stuff on body blogging here at Physiological Computing by using the body blogs tag. Gilleade, K., Lee, K. (2011) Issues inherent in controlling the interpretation of the Physiological Cloud. In CHI 2011 workshop on “”Brain and Body Interfaces: Designing for Meaningful Interaction””. Vancouver, Canada. Gilleade, K., Fairclough, S. H. (2010) Physiology as XP – Bodyblogging to Victory. BioS-Play Workshop at Fun and Games 2010. Leuven, Belgium.